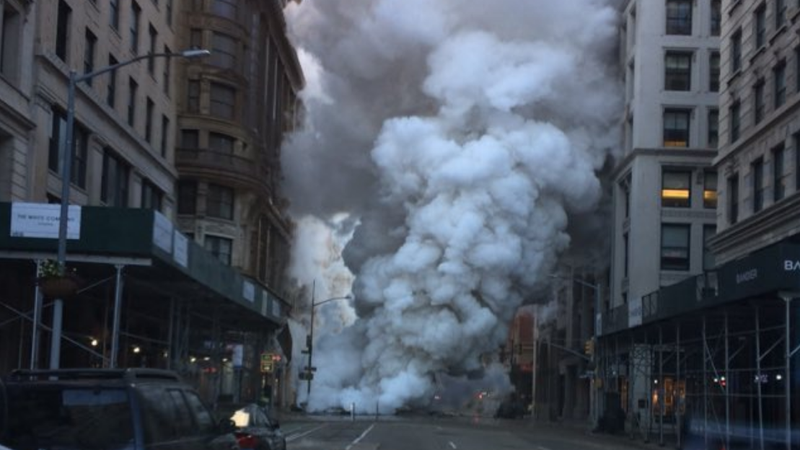 A steam pipe exploded in the Flatiron District of New York City this morning, leaving a crater in the street and steam billowing over the buildings. Five people suffered from minor injuries. Locals have been told to “assume disruption of normal traffic” by New York City Mayor Bill de Blasio as the roads will be closed for a few days. The blast occurred at around 6:30 a.m. near Fifth Avenue and 21st Street, according to NBC New York. Steam billowed from the hole and nearby streets were littered with chunks of asphalt. A gas line, water main and electrical power were also affected by the blast. The cause of the explosion is still being investigated. A water pipe installation was being performed at the intersection by a contractor for the city’s Department of Environmental Protection, according to the story, citing city records. However, de Blasio assured reporters that no one was doing work at the immediate location of the explosion during the time of the incident. A video uploaded to Twitter from NYC City Council Speaker Corey Johnson showed the pillar of steam rising up from the street. “The billows were about six-stories high. There was a large scatter of debris. I was standing behind the police line when a Con Ed worker came rushing over and screaming at police and firefighters to push everyone north because he was worried that there could be secondary manhole explosions. So far, the tests have been positive for asbestos, but the air is safe, according to the Associated Press via the Washington Post. The streets will probably be closed for a few days, it’s unclear how many. Forty-nine buildings were evacuated. Throughout the day, road closures and detours affected public transit systems. The MTA had the R and W subway lines skipping stops near the explosion. Local buses were being detoured as well. NBC New York’s Adam Kuperstein reported that FDNY put up a decontamination tent two blocks from the explosion. First responders were being brought there. Two more decontamination stations were set up later on. FDNY asked that those who felt that they were possibly contaminated to go to one of the stations for evaluation. In 2007, another steam pipe exploded under the street near Grand Central Terminal. One person died and over 30 were injured. And in 1989, a deadly steam pipe explosion occurred beneath Gramercy Park. Over 200 residents in a nearby building were ordered out of their apartments after asbestos fibers were discovered in the building. The city declared a health emergency, according to the New York Times, and an evacuation of another apartment building was ordered. The explosion happened in late August. People were not permitted to return to their homes until late November.